High above the Rocky Mountains, a routine airline flight becomes a midair standoff as 130 passengers listen to their captain relate the unprecedented demands of an unseen hijacker. Federal and state officials must hunt down, arrest, and indict the murderer of a young girl, and do it all in eight hours - or the airplane will be blown out of the sky. With the airline in confusion, the media pursuing, and the hijacker forcing the aircraft into wild maneuvers as they head toward Salt Lake City, the FBI reluctantly fields its closest hostage negotiator, a rookie female agent and psychologist named Katherine Bronsky. Immediately, Bronsky finds herself sucked into the vortex of an impossible war of wills between a volatile, unstable hijacker holding the trigger to a bomb and stonewalling Justice Department officials who have no real intention of meeting the lone gunman's demands. When the hijacker suddenly refuses to land at Salt Lake City, Kat commandeers a business jet and races after the low-flying 737. As the jetliner runs low on fuel, she's stunned to discover that the man with the gun is none other than the murdered girl's father, and that one of his hostages is a front-runner to become the new Attorney General of the United States. 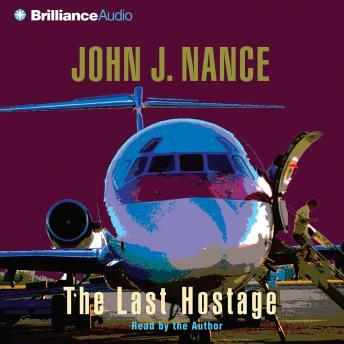 Successful at last in getting him to land in a remote Colorado airport, Bronsky's brave and desperate attempts to reason with the hijacker backfire, and she becomes a hostage herself. Now discounted and ignored by her superiors in Washington for losing control, Bronsky's only hope to save the passengers and crew of AirBridge Flight 90 is to solve the wrenching mystery of who killed an eleven-year-old girl in a dark Connecticut forest two years before. And for that, all she has is an airborne phone and precious few hours before the bomb detonates. Nance ratchets up the tension with expertly crafted twists and turns that converge into an unforgettably wrenching dilemma. But one thing finally becomes clear. The only person who can safely land AirBridge Flight 90 and save its 130 passengers is dangerously close to death. And if the clock runs out, The Last Hostage will never see the light of day.